Grip strength is extremely important for sports and daily life. In many different sports, grip strength can immensely affect success and performance. Any time strength training is involved it must be age appropriate to ensure safety, success, and fun! 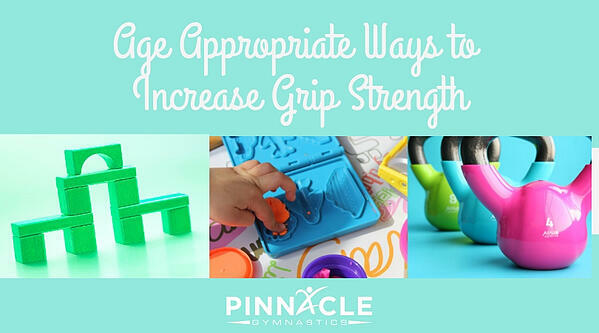 There are many different ways to improve grip strength. Here are some easy ways to improve grip strength at home without the use of a bar or gym equipment. 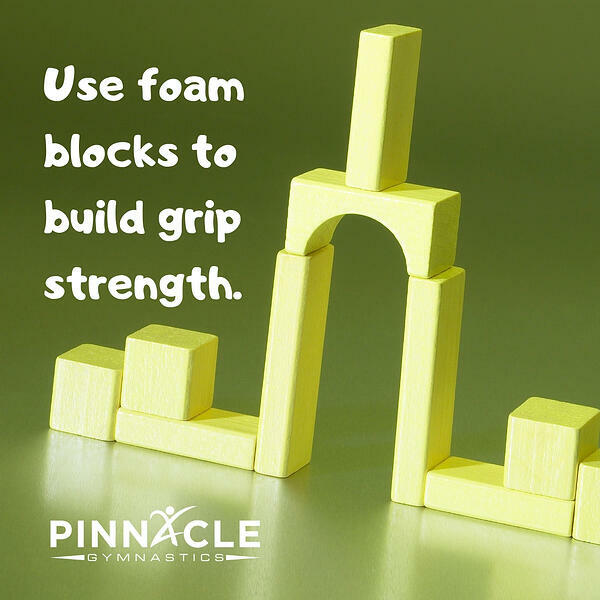 Depending on the size and shape, foam blocks are very difficult for children to grab and carry. The use of different games such as catch and putting the block through a hoop keep the skill interesting, but improve grip strength. Using two blocks at one time allows for them to ensure the use of both hands. Squeezing the block between their fingers and holding onto the block build strength. Block size changes the difficulty. Creating small changes such as blog size and game variation help keep exercise creative and fun. Thera-putty is commonly used in physical therapy for rehabilitation after an injury. However, it is a very useful tool to improve grip strength. Work on rolling the putty into a ball then squeezing it into a tight fist. Create different shapes to apply different types of pressure. This can be done with actual thera-putty or just with regular putty you may have around the house or from the store. To increase difficulty switch to using just your fingers or a single finger to squeeze the putty. Use different amount of repetitions and sets to vary difficulty. Combine this with academic principles such as counting sections or forming letters. This exercise is very simple and works on muscle control of the hand instead of overall grip strength. Take 15-30 small objects of varying sizes and shape and place them in a small container. Pour all of the objects out and put each one back in the container one at a time. Items to be used can vary whether they are marbles, rocks, blocks, whatever is small and vary shape/size. Try using specific fingers or groups of fingers to place the objects into the bucket. For example using all 5 fingers compared to using just your pinky and thumb. Increase the sets to increase difficulty. Banded extensions/flexions are a great way to improve hand and finger strength against resistance. For flexions, a small band can be attached to a stationary anchor. Have the band set on the inside of your fingers. Grip and pull the band to the palm and hold. For extension, you can use a small rubber wrist band. Put all of your fingers together, place the band around the fingers and extend all of your fingers out then hold. Hold the extension for time, approximately 20-30 seconds. More sets and time can be added to increase difficulty or endurance. Weighted holds can be done with a dumbbell, weighted plate, or any round weighted object. The weight can be held by gripping it against the palm of your hand with your fingers wrapped around. To focus on hand and finger strength the weight can be gripped between the fingers only. Hold the weight for time, approximately 20-30 seconds. More sets and time can be added to increase difficulty or endurance. 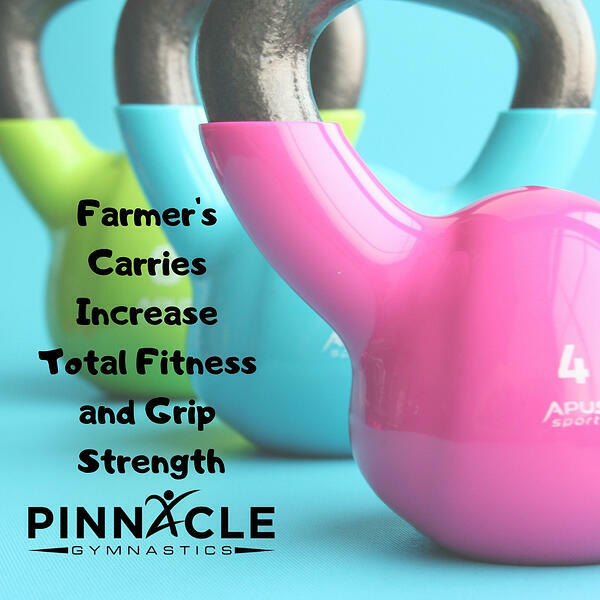 Farmers carries not only improve grip strength, but are a total body exercise affecting all parts of the body. Using dumbbells, weighted plates, or weighted objects in a safe manner, have one weight in each hand, carry them down and back to the start. Increase the distance, weight, and reps to increase difficulty. Focus on keeping the weight tightly held and keeping the body completely tall when carrying the weight. Grip strength is extremely important in many sports such as gymnastics, basketball, football, and even Ninja Classes and rock climbing! Try out these exercises to help increase your grip strength and see more improvement in your sport or activity.